Too often doctors and opticians alike do not feel as if eye/body health is in the realm of what an optician should know. We beg to differ. In that spirit, our blog post below discusses common systemic conditions and how they appear in the eye. 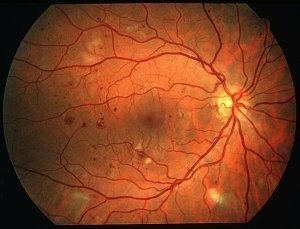 The eye is the one place of the body where vascular, neurologic, and connective tissues can be directly observed without the need for invasive techniques or costly scanning procedures. For these reasons, many systemic conditions are diagnosed during a routine eye exam, sometimes even before the patient experiences any symptoms. Here are a few such examples. Diabetes is a disease of poor blood sugar regulation. As blood sugar increases, several ocular tissues become affected before the patient is even aware of the underlying condition. Diabetes will cause the blood vessels of the body to become more porous, causing leakage. During an eye exam this leakage can be directly observed. Uncontrolled, this leakage will cause progressively increased bleeding inside the eye. 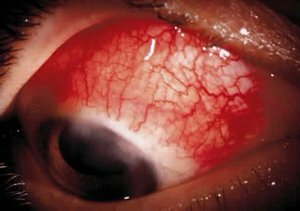 This bleeding can cause visual symptoms in a variety of ways, from reversible swelling of the photoreceptors in early cases to permanent scaring and retinal detachments in more sever cases. Increased blood sugar levels will also cause changes to the lens within the eye. For example, diabetics are at increased risk for earlier onset of cataracts (a clouding of the lens). If your optometrist sees cataracts that appear more advanced than your age would otherwise indicate, diabetes may be suspected. Additionally, the metabolic changes that come with diabetes causes swelling of the lens. This swelling will induce a moderate to severe shifting of your glasses prescription, even before cataracts or bleeding inside your eye is seen. A large or sudden glasses prescription change will be an indication to your optometrist that diabetic testing may be needed. Your carotid arteries are a major highway for blood flow from the heart to your eyes. With age, these arteries can become progressively clogged, causing a decrease in blood flow to your eyes. A strong flow of blood to the eyes is like a fully charged battery, it keeps your eyes functioning properly. As blood flow is decreased, however, certain symptoms may occur. Amaurosis fugax is a common symptom of carotid artery disease. Amaurosis Fugax is a temporary (usually 1-10 minutes) dimming of vision, usually in one eye caused by a partial obstruction in blood flow to the eye. Often this is from one or both of your carotid arteries narrowing in size due to plaque buildup along its inner lining. Similar to a mini stroke, the symptoms are transient and are therefore unfortunately often dismissed by the patient as being unimportant. Any transient vision loss should be reported to your optometrist immediately. Testing for carotid artery obstruction is performed using an easy, non-invasive, ultrasound. An artery occlusion occurs when an obstruction of blood flow to the eye becomes more than just partial, but rather completely obstructs blood flow to tissues. In this case the vision loss has a higher likelihood of being permanent. Often caused by a plaque from the carotid artery breaking loose, the plaque flows through the arteries to the eye through ever-narrowing blood vessels until it becomes lodged. When this happens, blood may no longer be able to pass through the artery to nourish tissues beyond the clog. Ocular tissues are highly dependent on sufficient blood flow for healthy function, so a complete blockage will cause sudden vision loss that likely becomes permanent without immediate medical attention. 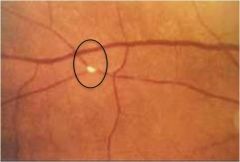 It is not unusual for your optometrist to see tiny non-symptomatic plaques in the blood vessels of an eye. In such cases, you will be likely be referred for an ultrasound of your carotid arteries to determine the source of the plaques. If the carotid arteries are clear, a referral to a cardiologist will be made next to determine if your heart valves may be the source of the plaque. Regardless of the source, determining where the plaques are arising is important in order to properly treat the underlying cause and to reduce the risk of future strokes. Autoimmune disorders can cause a variety of ocular conditions, primarily Dry eye, Uveitits, and Scleritis. Rheumatoid arthritis, for example, can lead to a condition called Sjögren’s syndrome. Sjögren’s syndrome often coexists with rheumatoid arthritis and affects glands of the body, such as the tear producing glands. When the tear glands fail to produce the normal quantity and quality of tears, you may experience a burning, sandy, sensation of the eyes. Dry eyes will also become rough on the surface, affecting the quality of vision as well. Uveitis, an inflammation of the tissues inside the eye, is also common in autoimmune diseases. Often presenting as moderate to extreme light sensitivity and generalized achiness of the eye, uveitis is diagnosed by your eye doctor when they see inflammatory cells floating inside your eye. When a diagnosis of uveitis is made, your optometrist will likely order blood work to rule out the presence of autoimmune conditions of which you may not already be aware. 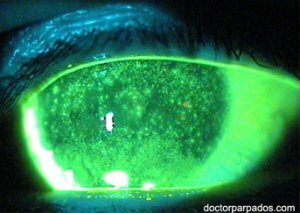 Scleritis is another ocular condition associated with autoimmune conditions. Presenting as a red, burning, sore eye, scleritis is an inflammation of the white part of the eye (the sclera). The tissues of the sclera are histologically similar to those found in joints, so conditions that cause an inflammation of joints can also cause an inflammation of the sclera. Similar to uveitis, when this diagnosis is made blood work will often be ordered to rule out an autoimmune cause of the inflammation. Eye exams are for far more than just updating your glasses. Routine yearly exams along with a check whenever you notice something not quite right can help make a diagnosis of a systemic condition you did not even know you had, may save your sight, and sometimes even save your life.